Context - While energy efficient compact fluorescent lamps consume less electricity and lead to less emissions from power plants, they do contain mercury – a hazardous material. Overall, in terms of mercury emissions, are compact fluorescent lamps beneficial to the environment compared to other lamps? Currently, traditional light bulbs are being phased out in favour of more energy-efficient lamps, mainly compact fluorescent lamps (CFLs) that contain some mercury. 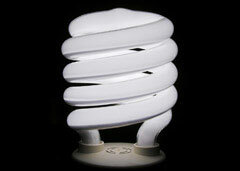 Because mercury is a hazardous material, it is generally banned in electric and electronic equipment, but is exceptionally allowed in limited quantities for example in compact fluorescent lamps. At present, it is scientifically and technically impossible to produce mercury-free compact fluorescent lamps, but new technologies can reduce the amount of mercury contained and the authorised content will be gradually lowered. 2.2 When a fluorescent lamp breaks, the level of mercury vapour in the air of the room can briefly be relatively high, but rapidly the vapour turns to liquid droplets that may stick to surfaces or dust for some time, particularly if the room is not aired sufficiently and cleaned thoroughly. Thus mercury could be inhaled or swallowed by people in the room. It is very unlikely that such a breakage would pose any health risks to adults and the risk to a foetus exposed through its mother is negligible. 3.1 Compared to traditional incandescent bulbs, compact fluorescent lamps save not only energy but also mercury emissions during their entire useful life. This saving in mercury emissions exceeds the amount of mercury they contain and that they could potentially release if broken or inadequately disposed of. Indeed, producing electricity in coal-based power plants leads to the release of mercury to the environment. Since close to a third of electricity in Europe is produced from coal, using any type of light bulb contributes to mercury emissions, even if the lamp itself contains no mercury. 3.3 In the EU, the estimated mercury emissions associated with the use and disposal of household lamps (incandescent, halogen & CFLs combined) are relatively low compared to other sources. It is therefore considered very unlikely that their contribution to the amount of mercury present in the environment poses any risk. Because of their mercury content, compact fluorescent lamps should increasingly be recycled and not discarded inappropriately with unsorted waste. The EC Scientific Committee on Health and Environmental Risks (SCHER) is therefore of the opinion that compact fluorescent lamps offer a net environmental benefit compared to the other light bulbs considered, even when mercury content is taken into account. Compact fluorescent lamps that break accidentally in a consumer’s home are not expected to pose any health risks to adults and the risk to a foetus exposed through its mother is negligible. However, no conclusions can be drawn on the potential risks to children, namely because there is a lack of data about the possibility of swallowing any droplets of mercury left on surfaces or dust (see question 2).